I don't know why it's taken me so long to jump on the henley tie-front top band wagon but I'm finally here for it and I'm in LOVE! 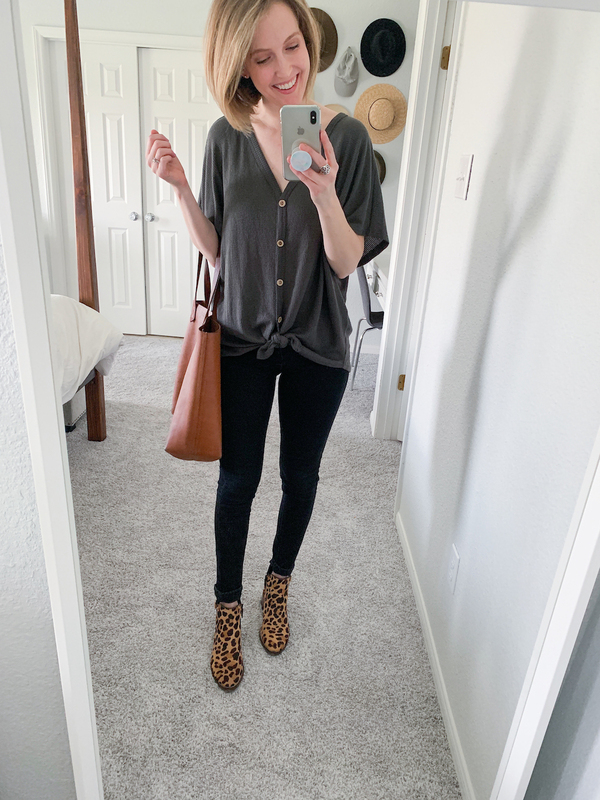 I recently was sent this top from Jane.com and I've found it's extremely versatile (unfortunately this exact one is sold out but I'm linking a ton of others). 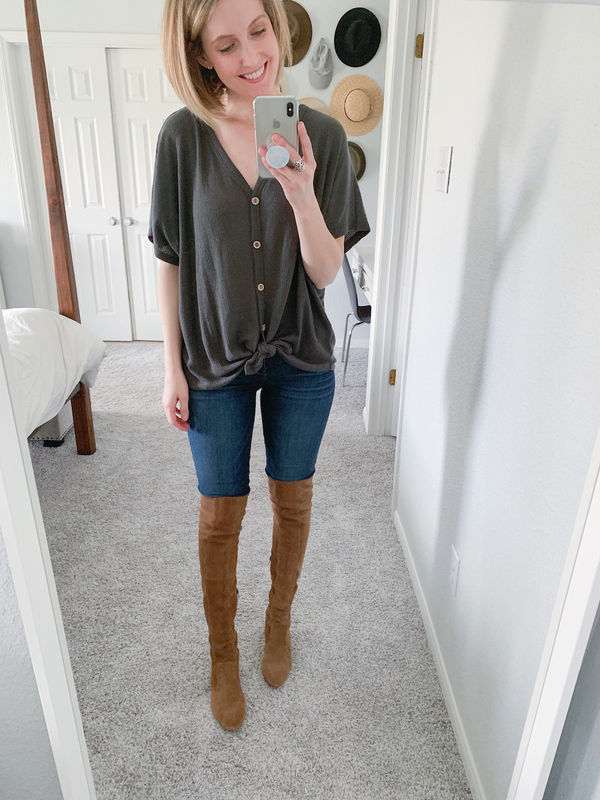 I love the v-neck and tie-front which makes it feminine but the loose sleeves and mid-section make it super comfy and hides a food baby really well ; ). Here are three fun ways I styled this top! This look is a bit dressier as I pair the top with fitted jeans and over-the-knee boots. Would be fun to wear on a date night or to dinner with your girlfriends. Kid's soccer game? Weekend errands? This comfy and casual look is perfect for moms on the go! 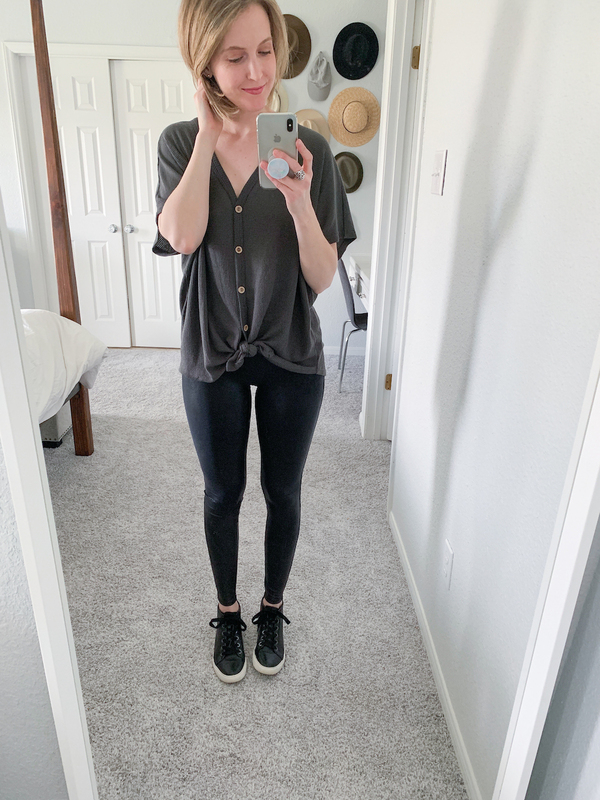 I paired my top with my FAVORITE high waisted leggings and my Kenneth Cole leather sneakers. I think a baseball cap and a utility jacket would pair perfectly with this look as well. Last but not least, add some pattern to the mix by pairing this top with a pair of leopard boots. In the summer swap out the black jeans for black shorts and add some leopard sandals or wedges! Do you enjoy these style posts? I cringe a bit because the quality of my photos aren't great, but I do love sharing ways to style certain pieces. Most of us are on a budget and aren't fashion bloggers constantly shopping so we need to make our closet work for us! We never really know the full potential of our closet until we mix and match, play dress up and find new and fun ways to wear each item. Let me know if there are any specific pieces of clothing you would like me to style? Super cute! Have a super weekend Jesse!